Taking care of your skin is a big job. You have to understand your skin type, craft the perfect skin care routine, and learn how to care for whatever conditions you have. On top of all of that, your skin has a particular chemical composition that needs to be taken into account when it comes to skin care. Using pH balanced skin care products that balance your skin’s pH leads to healthy skin. We’ve created this little infographic to help you get there. Let’s go back to high school chemistry for a bit. All compounds and materials, including your skin, are either acidic or basic. The pH scale measures this. Acidic substances have a pH of less than 7, while basic substances have pH levels that are greater than 7. Through our research, we’ve learned why we must take skin’s pH into account. 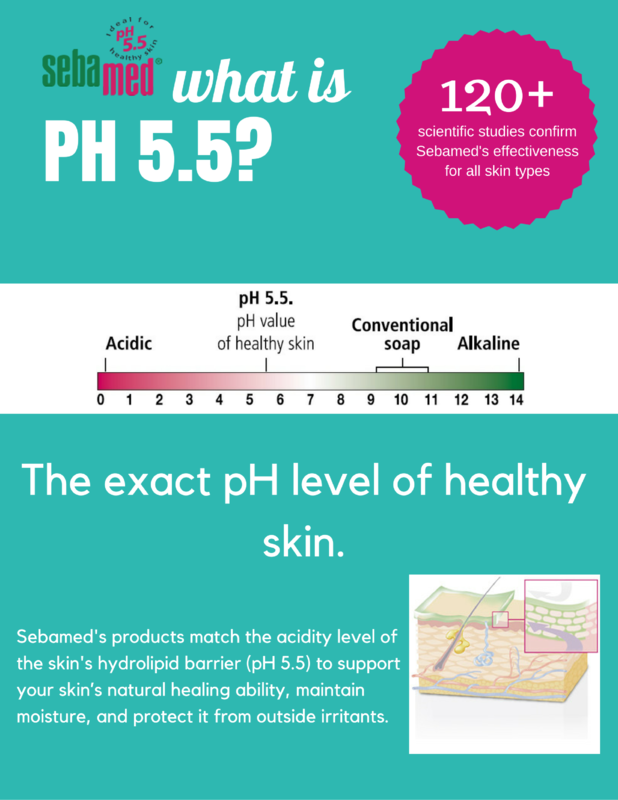 The pH level of healthy skin is 5.5. It may surprise you to learn that your skin is slightly acidic, but stay with us! Your skin has a hydrolipid barrier that protects you from harmful irritants and pollutants in the environment. This barrier is acidic and has a pH of 5.5. When your skin barrier functions well, your skin is healthy, so we strongly recommend using products that are pH balanced to match the acidity of your skin barrier. As you can see from our infographic, most soaps or washes on the market are basic, which means that they can wreak havoc on your skin barrier. These products can actually wear down your acid mantle. By using them, you are more susceptible to conditions, such as eczema and psoriasis. Since your skin barrier supports healing, locks in vital moisture, and protects you from irritants, give it the love it needs! Use pH-balanced products for healthier skin with every use. Need a little pH 5.5 in your life? Sebamed’s products are formulated to support your skin’s function and stabilize skin barriers that need a little extra care. Check out our full range of washes, creams, and lotions here.